Remember those old games that you loved as a kid - Operation, Etch-a-Sketch and Boggle? Well, now you can revisit these games in the office! Vat19.com sells these cool classic game pens -- and they actually work! 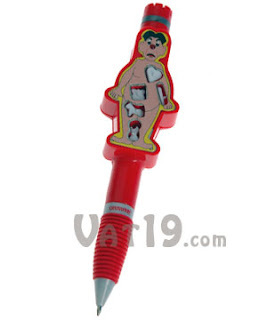 Pull out organs and bones from the Operation pen, or mimic your fave Picasso print on the Etch-a-Sketch. These writing instruments might be just the solution to get you through that trip to Snoreville - a destination known as the weekly departmental meeting! Now if only they could customize Ker-Plunk into a pen! My sister got "Operation" candy while trick or treating this year! Coolest thing ever. There is also "Clue" candy! It makes you want to be a kid again... or just act like a kid lol. Operation candy?? Wow...must find it! Thanks for the tip, Rebecca. I'm glad you like our Game Pens! Thank you for writing about them. Operation candy sounds fun and cool, too. I didn't even know that existed!